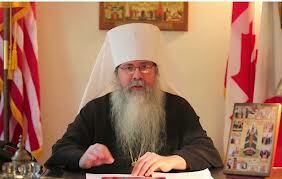 The schedule of services at which His Beatitude, Metropolitan Tikhon will preside has been released. On Lazarus Saturday, April 27, Metropolitan Tikhon will celebrate the Divine Liturgy at the Fort Bliss Orthodox Chapel, El Paso, TX. The following morning—the Great Feast of the Entrance of Our Lord into Jerusalem—he will celebrate the Divine Liturgy at the chapel. 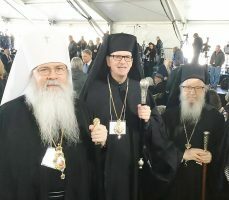 On Holy Monday, April 29, he will celebrate the Liturgy of the Presanctified Gifts and Bridegroom Matins at Saint Sergius Chapel at the Chancery of the Orthodox Church in America, Syosset, NY. He will celebrate the same cycle of services at Saint Tikhon’s Monastery on Holy Tuesday, April 30. 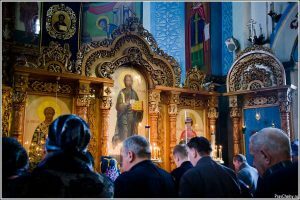 The following day—Holy Wednesday, May 1—he will celebrate the Liturgy of the Presanctified Gifts and the Matins of Holy Thursday at the monastery. On the morning of Holy Thursday, May 2, Metropolitan Tikhon will celebrate the Vesperal Divine Liturgy of Saint Basil the Great at Saint Tikhon’s Monastery. Metropolitan Tikhon will celebrate the remaining Holy Week and Paschal services at Saint Nicholas Cathedral, Washington, DC according to the following schedule. 7:00 p.m.—Matins of Great and Holy Friday with the Reading of the Passion Gospels. 2:00 p.m.—Vespers with the Placing of the Holy Shroud. 7:00 p.m.—Matins of Holy Saturday with Procession. 10:00 a.m.—Vesperal Divine Liturgy of Saint Basil the Great. 11:30 p.m. Saturday night—Nocturns, followed by the Midnight Paschal Procession, Matins, and Divine Liturgy.